Grease two medium size loaf pans with melted butter. Sift flour and baking powder into a large bowl. Beat butter and powdered sugar until light and creamy. Add eggs one at a time, beating well after each addition. Add lemon juice and zest. Add half the flour mixture, mix well to combine. Add yogurt, mixing well to combine. Add the rest of the flour. Beat just to combine (don't over mix!). Fold in blueberries. Spoon batter into loaf pans. Bake for 1 - 1 1/4 hours or until a skewer comes out clean when inserted into center. Remove from the oven. Leave in the pan for about 10 minutes before turning out. Whisk flour, cream, egg yolks, powdered/icing sugar and vanilla to fully combine. Heat milk on medium heat until just warmed through and whisk in the cream mixture. Continue whisking until sauce is thick and shiny. Looks fantastic Mia. 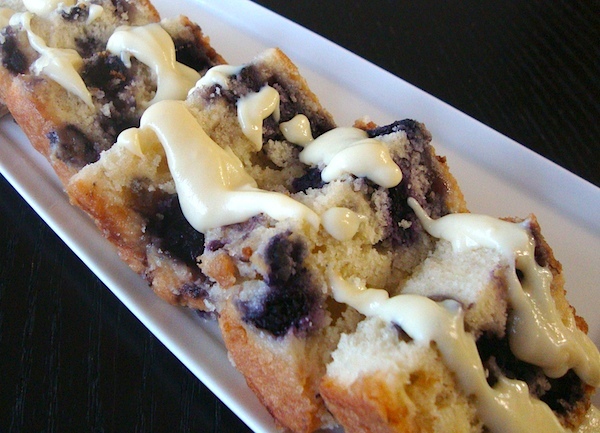 I love lemon and blueberry and I bet it tastes perfect together. Thanks, Carrie! It was a hit! Love the cake, and the glaze just puts it right into Must-Have territory! What Does “Natural” Meat Really Mean? Avoid These 9 Worst Food Ingredients! Healthy Food - Against the Law?